Typically in our Artist Spotlight series, we do exactly what it says on the tin: examine the careers, works, and lives of prominent or emerging artists from around the world. In today's edition of the Artist Spotlight, however, we're going to look at an artist who is literally out of this world (for now, at least): Scott Kelly, an astronaut currently residing on the International Space Station. While some may argue that he may not be an artist in the traditional sense, it's hard to look at his stunning photographs of the Earth's surface without seeing echoes of modern abstract art. Having resided on the International Space Station for the last several months, Kelly has been populating his Twitter feed with photographs of the Earth since he first docked and went aboard. The photographs are truly incredible, all the more beautiful for the fact that the medium he's photographing is the topography of the entire planet. The latest series of abstracts he's been posting are from his passage over the continent of Australia, which is already somewhat famous for its impressive topography. Some of the oldest rocks on the surface of the planet can be found here, and perhaps that's partly to credit for the impressive quality of the abstracts Kelly captures. He photographs from the observation cupola of the International Space Station (ISS), a multi-windowed bubble on the Earth side of the station. Ostensibly, Kelly's mission is to spend an entire year in space, to help NASA and the other space agencies involved in the product understand the effects of long-term space habitation on the human body. If his photographs are anything to go by, it's clear that extended time in space doesn't prevent or limit human creativity in the slightest, which will no doubt be excellent news for the cultural development of any future interplanetary colonies. To keep up with Kelly's photographs during his entire year aboard the ISS, be sure to follow his Twitter account, which can be found here: https://twitter.com/StationCDRKelly. 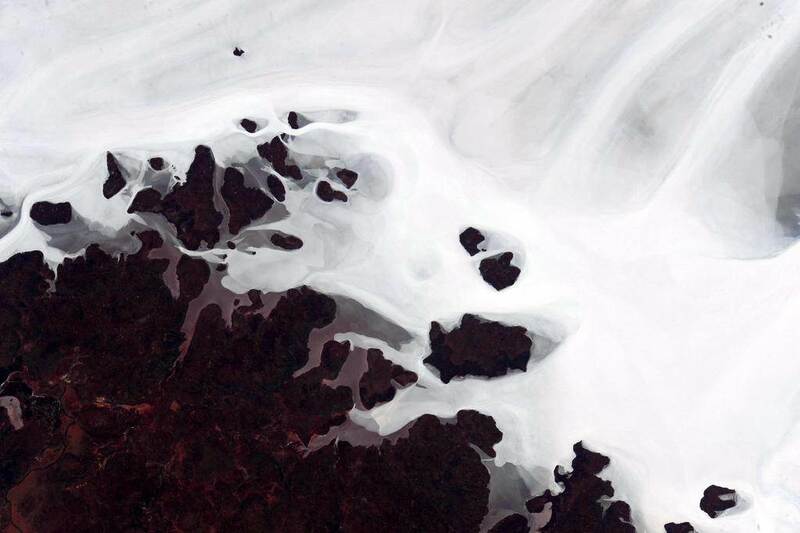 Kelly has been tagging all his photos with the hashtag #EarthArt, which was first used during a Google Earth project that scanned the globe for interesting and appealing topographical features. Stay tuned for more photographs as he passes over other continents during the rest of his #yearinspace mission, and get a truly unique view of the world we all know and love.